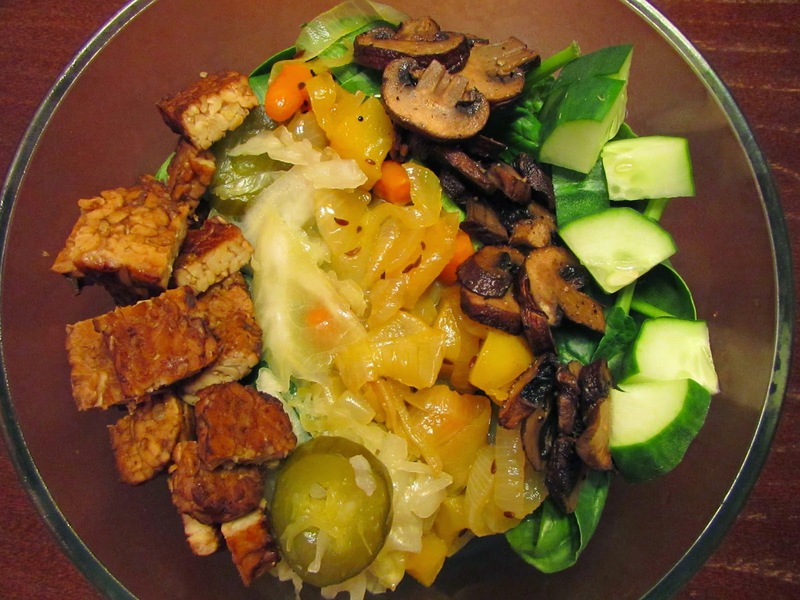 This Reuben salad is packed with savory tempeh and mushrooms, acidic sauerkraut, caraway-flecked onions and carrots, and crisp cukes- all atop a bed of spinach. 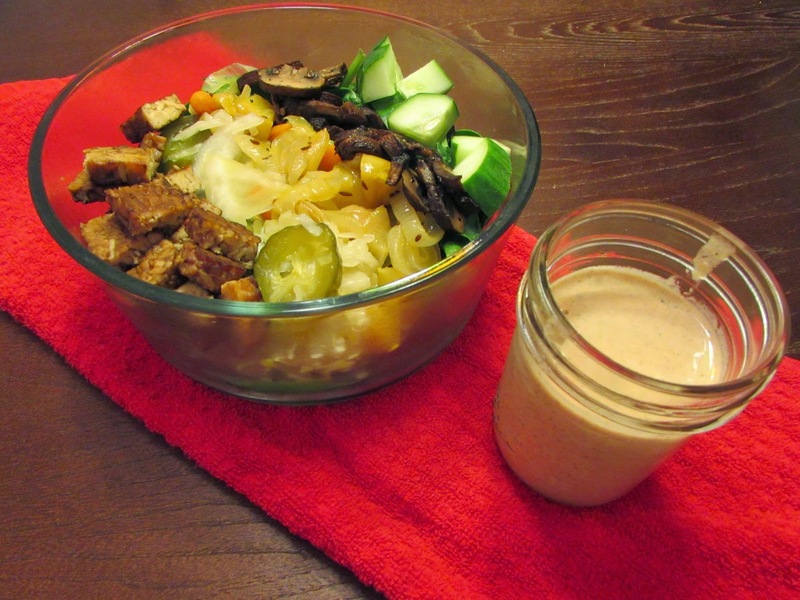 On the side is a creamy hemp-based Russian dressing. My inspiration for this recipe was, oddly, my bout with Lyme disease. Nothing serious, folks- no need to worry. But, moral of the story is that I was taking antibiotics twice a day. I wanted to pack my body as full as possible with probiotics during these three weeks, as I was stripping it of all bacteria, friend and foe. 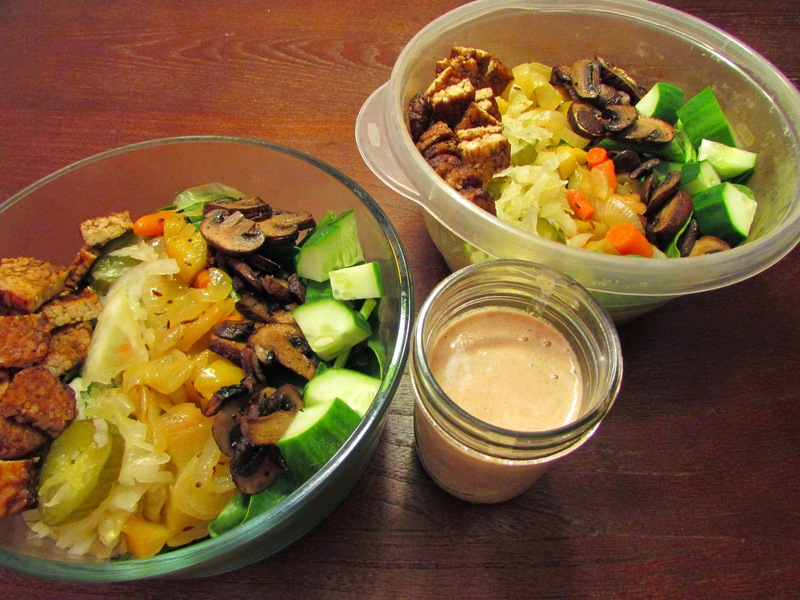 So it being Vegan Mofo and all, I challenged myself to come up with a probiotic-heavy salad. Et voila: the Vegan Reuban Salad was born. 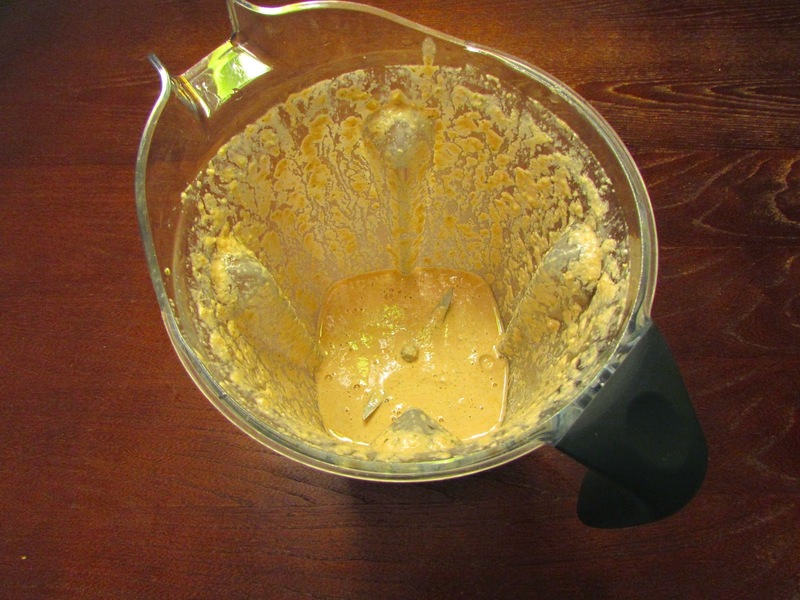 This sweet and velvety hemp dressing was an awesome Russian dressing substitute, and a breeze to blend up in the Vita. Whether you’re craving a reuben sandwich and want a healthier take, you’re bored of your spring mix, or you’re looking for a probiotic pow, this salad is a fantastic and flavorful meal. Mix first five tempeh ingredients together in the bottom of an 8 x 8 dish. Add tempeh. Allow to marinate for at least 2 hours, preferably overnight. After tempeh is done marinating, heat over to 400 degrees F. Bake tempeh uncovered for 20 minutes or until no juice remains in dish, flipping tempeh once. Line a sheet tray with tinfoil and spray with oil. Dump baby portobellos on tray and season with salt and pepper. Bake in the same oven as the tempeh for 15-20 minutes, or until mushrooms are roasted to your liking. Heat oil for caraway veggies in sautee pan over medium heat. Add onions and cook until translucent. Add in rest of caraway veggie ingredients and cook for 5-10 more minutes, until soft. Turn off heat and set aside. 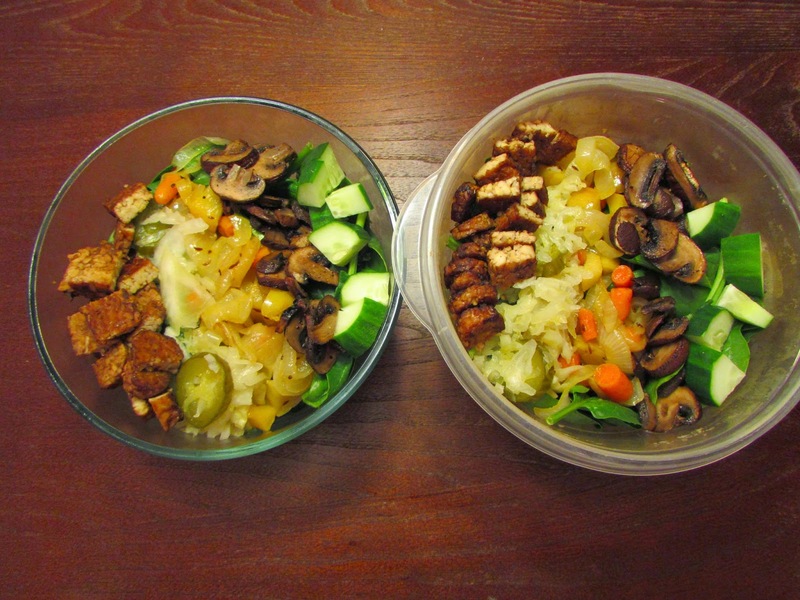 Arrange two bowls with greens, caraway veggies, tempeh, cukes, sauerkraut. Sprinkle with salt and pepper. Put all dressing ingredients in blender and blitz until combined. Drizzle over salad for a salad take on the classic NYC sandwich. 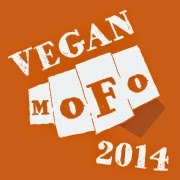 Note: You will likely have tempeh left over, depending on how much you want on your salad. I used a fourth of a block per salad. 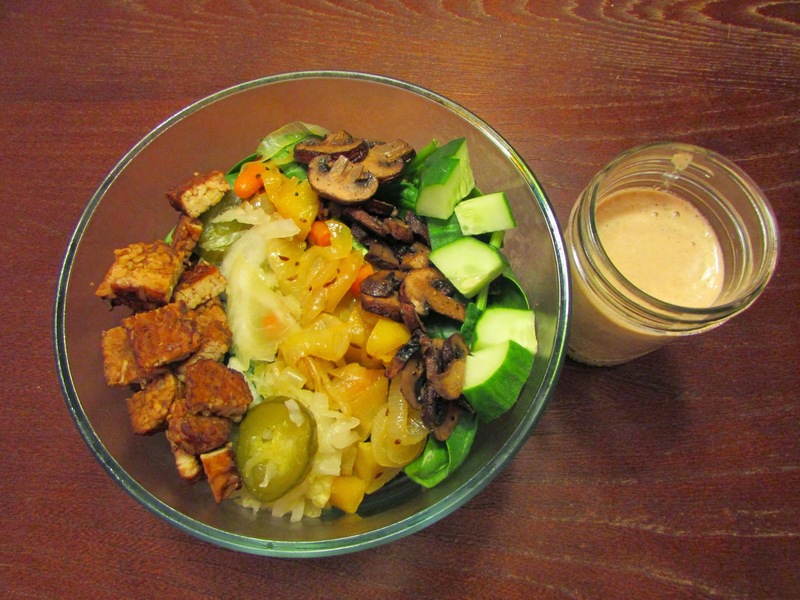 Okay I'm not the hugest salad fan but I love both tempeh and sauerkraut so this is definitely tempting me! Aw, thanks! I'm glad this salad could tempt a non-salad fan. I hope you try it out!